Seether have announced the fifth annual Rise Above Fest, with some exciting new developments. Due to popular demand, the multi-stage music festival has expanded to two days for the first time in its history. Rise Above Fest, which supports suicide prevention and mental illness, is the largest suicide awareness music event in the world and has established itself as a “can’t miss” destination festival of the summer for hard rock fans. This year’s Rise Above Fest is set for Saturday, July 22 and Sunday, July 23. The event returns to Darling’s Waterfront Pavilion in Bangor, Maine. The 2017 Rise Above fest lineup is a veritable “Who’s Who” of rock music, with Korn set to headline Saturday night, alongside sets from Seether, Stone Sour, Skillet, Falling in Reverse, and more. Shinedown will close Sundaynight’s festivities, along with performances from Halestorm, Theory of a Deadman, Hellyeah, and All That Remains, among others. In addition to giving rock fans a must-see lineup of bands, the event, which borrows its name from the Seether song “Rise Above This,” brings awareness to suicide as an epidemic and destigmatizes depression and other mental illnesses. As fans are well aware, Seether frontman Shaun Morgan lost his brother to suicide nearly a decade ago and penned the song as an ode to him. The singer’s personal experience with suicide lead to the creation of Rise Above Fest. Additionally, Morgan was honored last year with the “Artistic Expression” Award from the National Council for Behavioral Health at the Awards of Excellence in Las Vegas for his tireless work as an advocate of suicide prevention. 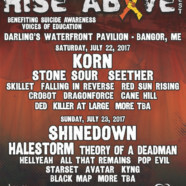 All proceeds from Rise Above Fest benefit SAVE (Suicide Awareness Voices of Education), which is one of the leading national not-for-profit organizations dedicated to raising awareness and educating the public about mental health and suicide prevention in order to SAVE lives.